Wednesday and Pugsley at "play." One of America's favorite dysfunctional families is back in a musical that'll have you humming the now-familiar theme all over again: ba-da-da-dum — snap-snap. Kooky? Yes. Spooky? Not so much. But funny? Yes — expect enough loud laughter to wake the dead at The Addams Family: A New Musical Comedy at Coeur d'Alene Summer Theatre. Directed by Makaela Pollock, CST's version mostly follows Broadway's, which ran 18 months until beginning a national tour in 2011. Based on the book by Marshall Brickman and Rick Elice, who first teamed up on the smash play Jersey Boys, and with music and lyrics by Andrew Lippa, the new Addams Family is a twisted twist on the classic theme of boy-meets-ghoul. Wednesday, the morose daughter of Gomez and Morticia Addams, is a devious schemer prone to attempted murder of her brother, Pugsley, and hunting with her crossbow. She meets Lucas Beineke (Cody Bray) who not only is not weirded out about her weirdness, but inspires her to wax poetic about all things fluffy and cute. Her "unusual" behavior creates chaos in the family, who host the Beineke family for a getting-to-know-you dinner, sort of Meet the Fockers meets the Rocky Horror Picture Show. The macabre family has been with us since the 1940s, when American illustrator Charles Addams first introduced them in cartoons in The New Yorker magazine. Picture black-and-white line drawings with simple crosshatching for shadows and you have the foundation for CST's innovative set designed by Jenny Littlefield: an ornate stairway in the family's run-down Central Park mansion, the concrete walls with requisite manacles in the torture chamber. When Addams was asked to provide names for a new television show in 1964, he lent his last name and The Addams Family enshrined the characters into our collective visual memory. That created a barometer against which subsequent iterations — including CST's version — get measured. 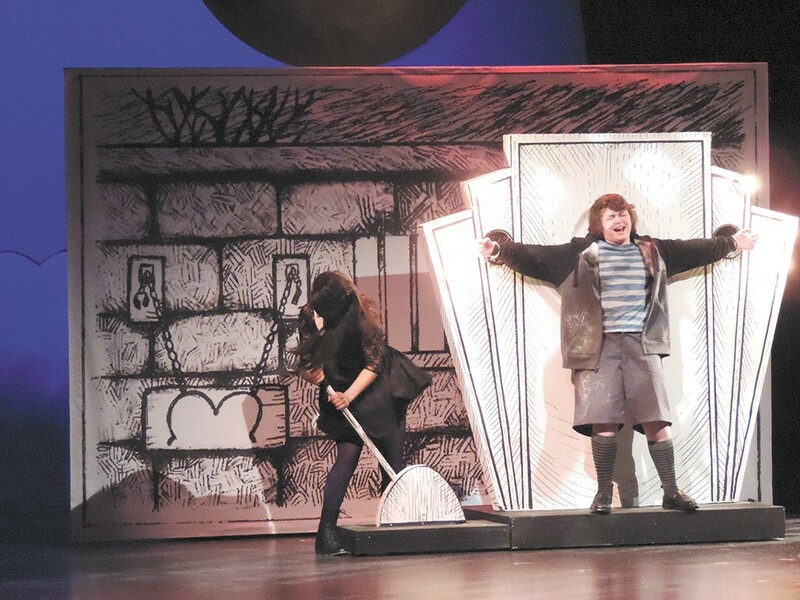 Thus Wednesday (Jessi Little), whom Addams named for the nursery rhyme in which "Wednesday's child is full of woe," seems too perky up-front and would benefit from Broadway's treatment, in which the opening scene establishes her innate quirkiness. Instead, the opening scene in the ancestral cemetery — fog rolling from underneath the curtain — launches a nonstop onslaught of song and dance, punctuated by wonderfully campy humor. Gomez (Steve Czarnecki) captivates as the nattily dressed patriarch, torn between keeping his daughter's betrothal a secret and his love (and fear) of wife Morticia (Christine Riippi), who vacillates between aloofness and Vaudevillian humor, such as in "Secrets." Both Wednesday and Lucas Beineke's mother, Alice (Heidi Santiago) prove their golden pipes. Even Lurch (Andy Renfrew) gets in on the action with a surprise vocal well into the curtain call.